Loyal and long serving employee Don Millward celebrated 25 years working for J.C.Walwyn & Sons Ltd on Friday 27th November 2015. Don from Longford near Ashbourne has had two spells of employment with the Ashbourne family run firm. He first joined the company in 1985 and was the main delivery driver before leaving for a short spell to drive heavy goods vehicles. Don returned in 1990, and with his experience in the business previously he returned to take up the position of Factory Manager in the Coffin & Casket manufacturing company. 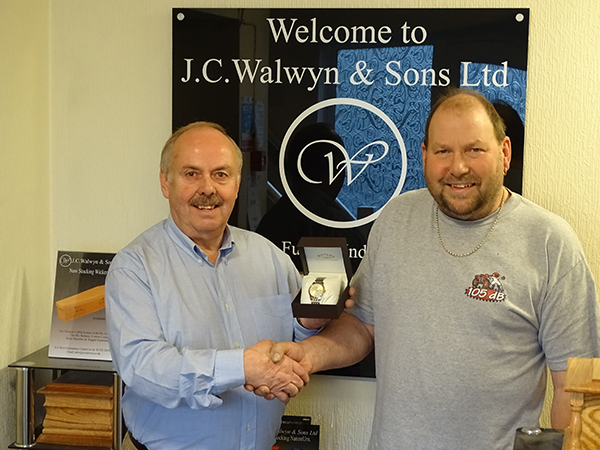 Don pictured on the right was delighted to be presented with a silver/gold engraved watch by Keith Walwyn Managing Director of J.C.Walwyn & Sons Limited as a thank you for his service over the years.